A 12-year-old girl was assaulted in Toronto Friday by a man who twice tried to cut off her headscarf with scissors and then fled, police said. Khawlah Noman told reporters that she was walking to school with her younger brother when the man came at her with scissors. "He tried cutting (off) my hijab two times," she said. "I felt really scared and confused. I didn't feel comfortable that people are doing this." Police described the assailant as an Asian male wearing a black hoodie and glasses. He was said to be about 20, nearly 6 feet tall and with a medium build. Authorities are investigating the incident, which occurred at about 9 a.m. (1400 GMT) near the Pauline Johnson school in Toronto's east side, police spokeswoman Katrina Arrogante told AFP. Constable Jenifferjit Sidhu told a news conference that Noman had turned and confronted her assailant, making loud noises to scare him off and then she ran away with her little brother in tow. Afterward, according to Sidhu, the girl noticed a 12-inch cut from the bottom up on the back of her headscarf. 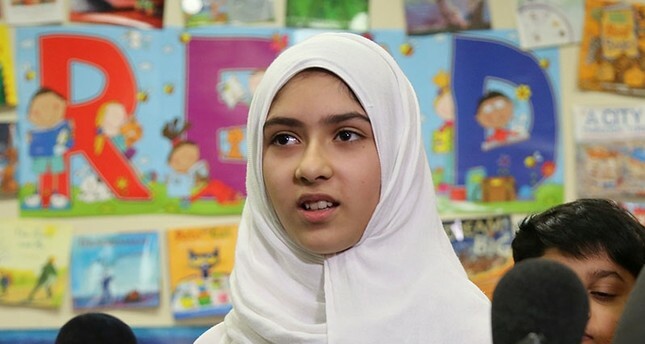 She and her brother joined a group of other students also walking to school, for safety, but the siblings became separated from the group and from each other at an intersection crossing. At that moment, less than 10 minutes after the first assault, the same man suddenly returned. Smiling, he allegedly tried again to cut off her hijab, before fleeing. "This is a cowardly act of hatred. It does not represent who we are (as Canadians)," Ontario Premier Kathleen Wynne said in a Twitter message. Meanwhile, Toronto District School Board spokesperson Ryan Bird told CBC that they are working closely with the police and are offering support to Noman and her family. "We must stand firm in our support of this young girl who was assaulted simply for wearing a hijab," she said. The school serves nearly 300 kindergarten to grade six students "of diverse cultural and socio-economic backgrounds," according to the local school board. More than two-thirds speak a language other than English at home. Like the rest of the world, Islamophobia has become a problem in Canada. There has been a surge in Islamophobic attacks in the country and mosques have been targeted. In January 2017, a gunman killed six people attending prayers at a mosque in the French-speaking Quebec City. The Canadian statistical agency, Statistics Canada, found that there was an increase of reported hate crimes against Muslims in Canada from 2014 to 2015, from 99 incidents to 159, an increase of 60 percent.